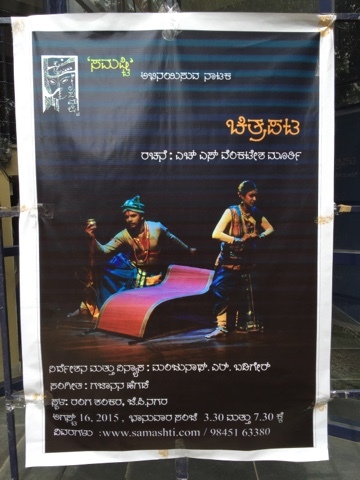 Kannada play directed by Venkatesh Murthy. The play kicks off with the story tellers who discuss amongst themselves what should they narrate which makes the audience head bow down with shame. Each of the four decide what story and finally agree to narrate the story of Ramayana. The storyteller narrate why Lakshmana cut Ravana's sister, Surpanakha's nose and how she instigates Ravana to abduct Sita. The ten headed Ravana becomes aggressive to an extent that he abducts Rama's wife Sita. Sita is kidnapped by Ravana, suffers separation from her dear husband, an exile in exile. A war between the good and the bad begins and Ravana's death marks Rama's victory but Sita undergoes **Agni Pariksha though Ravana never touched her. **Agni Pariksha - sacrifice in the fire. A ritual followed during old days to test the person truthfulness. The story takes a twist when Sita's childhood friend Parvati praises Ravana before her. Who is Parvati and why does she appear after ages? Watch this beautiful enacted play.